GREAT VALUE FOR MONEY! 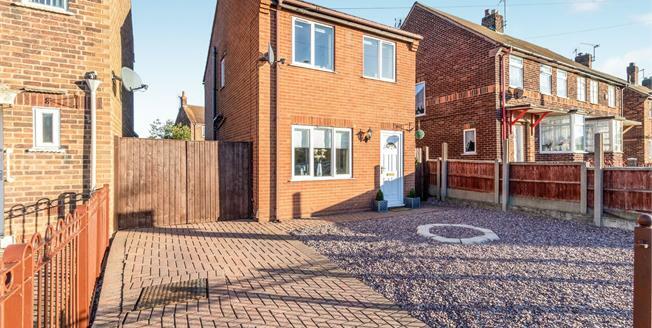 We are thrilled to welcome to the market this rare opportunity to acquire a modern three bedroom detached property for such good value. This property is a must view for families and first time buyers to appreciate what is on offer. The ground floor comprises of an entrance hall with stairs leading to the first floor and a door to enter the spacious and homely living room. The modern kitchen diner is accessed via the living room and spans the width of the property with doors opening out onto the garden. The first floor benefits from three good sized bedrooms as well as the modern family bathroom. Additionally the property benefits from double glazed windows, gas central heating, off road parking and and enclosed garden to the rear. Viewings are highly recommended as a modern detached house at this value will not be on the market long, so to avoid disappointment please call the office for viewing arrangements. Double glazed uPVC window facing the side. Tiled flooring, ceiling light. Double glazed uPVC window facing the front. Radiator and electric fire, ceiling light. UPVC double glazed door, opening onto the garden. Double glazed uPVC window facing the rear. Radiator, laminate flooring, ceiling light. Roll top work surface, fitted, wall and base and drawer units, inset sink, integrated, electric oven, integrated, electric hob, over hob extractor, space for standard dishwasher, space for washing machine, fridge/freezer. Double glazed uPVC window with frosted glass facing the side. Heated towel rail, tiled flooring, ceiling light. Low level WC, panelled bath with mixer tap, shower over bath, pedestal sink with mixer tap, extractor fan.